In a heavy based pan fry off Life's good Coriander & Almond Paste for approx. 1 minute. When fragrant, add chicken and stir until well coated with paste. Add cream and simmer gently until chicken is cooked. Remove from heat and set aside to cool (best to be prepared the day before required. Refrigerate overnight for best results). When ready to assemble pies, line 12 hole muffin tray with squares of puff pastry. Par bake until just golden brown. 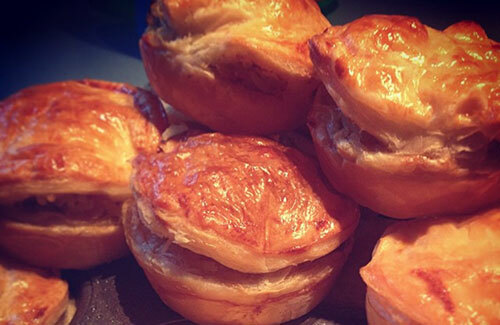 Spoon refrigerated Coriander & Almond chicken curry mixture into pastry shells and add a pastry lid if desired. Bake for 20 minutes in a moderate oven or until golden brown. TIP! These pies make perfect additions to school or work lunchboxes.